Home / Culturally Responsive Teaching / Propaganda: Data Doesn’t Lie; People Do! Propaganda: Data Doesn’t Lie; People Do! It has been 3 months since the election. After Donald Trump officially became the President my students have tried to discuss the election, however every single time they brought up the topic I would stop the conversation. I wasn’t trying to be mean but I wasn’t ready. I teach at an urban school and I knew that the conversation was going to be intense. When the students wanted to discuss the election, I wasn’t really sure that how I was going to address the topic. As a math teacher I haven’t addressed many current events, but I made a promise to myself this year that my instruction would be relevant to my students’ lives. 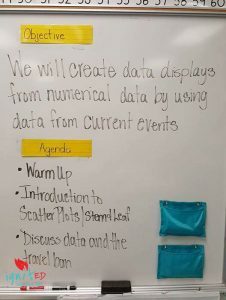 So when it was time to teach our data unit I was ready! The travel ban gave me the content that I needed to address the election of Donald Trump. In our data unit we are supposed to interpret data from bar graphs. I chose to use the The 9th Circuit Court of Appeals’ ruling from the travel ban to teach teach my students how to interpret data. The students watched news clips from CNN so that they could hear Donald Trump’s rational for writing the executive order banning people from the 7 countries. It was interesting to hear their thinking after they watched the news segment. Most of their conversations went from saying ” I don’t like Donald Trump.” to discussing how he mislead people. Normally when my students have to write in math they take forever. This time when I gave them the question “Was the President’s Ban Necessary?” There was NOT one student who didn’t have something to write about. Even my Special Education student who couldn’t write wrote the most perfect sentence I had seen all year! Dan Rather said in his recent Facebook post, “We must carefully separate what we know to be true, from what we think to be true, from what we do not yet know.” As an educator I’m trying to help my black and brown students focus on what we know to be true and not the “alternative facts”.